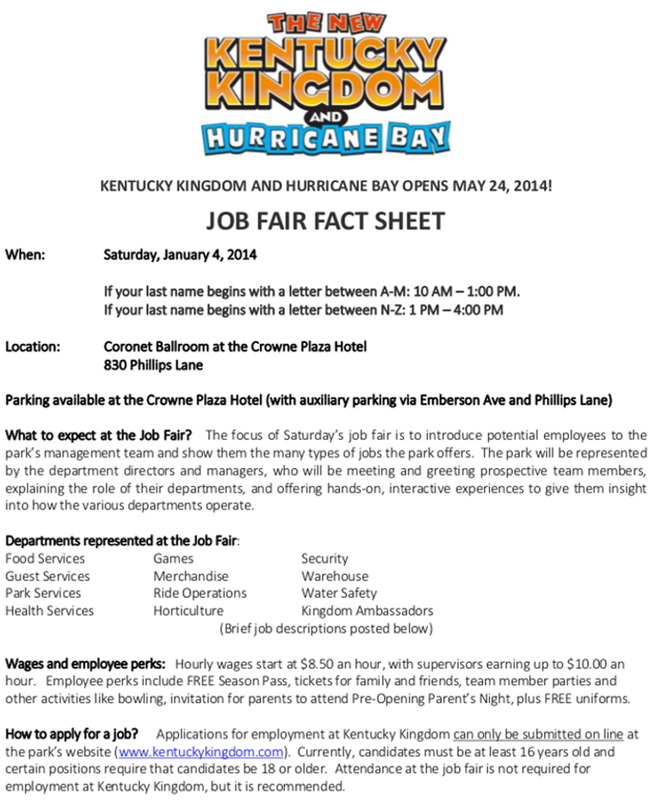 Kentucky Kingdom takes One Step Closer with Job Fair. In just 140 days Kentucky Kingdom plans to re-open an amusement park which has been shuttered since 2009, when Six Flags abandoned them. This weekend the park is moving one step closer to their big re-opening, a Job Fair. On Saturday, January 4th the park is holding a massive job fair to staff hundreds of positions around the park from Food Services to Management. Things are looking up for the park and hundreds of potential employees. Kentucky Kingdom is asking anyone who may be interested to read the information sheet (I've posted a copy here) and fill out an application online. 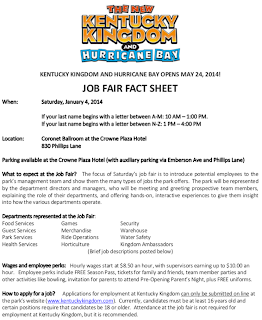 You can read the full descriptions of positions and information for what you'll need here- Employment at Kentucky Kingdom. The park is also working with the "Mayors Summer Works" program to help teens 16-21 get and hold summer jobs. They have a separate application at the bottom of the website. In a time when jobs are getting scarce, it's always great to see anyone having these large job fairs. It's also exciting to see the park getting on their feet and fighting the odds against closed parks never re-opening!